•Fresh unripened cheeses; cottage, cream ,ricotta,etc. •Double or triple cream; fat content of 60 -75 percent some are ripened others not, they include Blue Castello, Bavarian Blue, Cambazola, etc. •Swiss cheeses; Gruyere, Emmentaler, Raclette, Sprintz. •Cheddar; all the English style such as Cheshire, Wensleldale, Gloucester. Canadian and American, all varying degrees of sharpness. •Extra hard; mostly the Italian Grana, Parmesan , Pecorino, etc, all aged, maturity of two to three years. •Monastery; Roblechon, Havarti, usually washed rind cheeses. 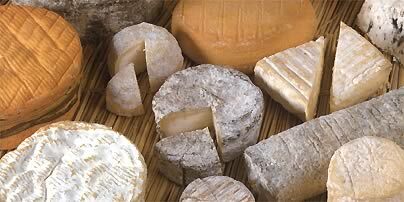 •Camenbert/Brie; bloomy soft rind Coulommiers, Chaource, lots of others. •Blue vein; Roquefort, Stilton, Gorgonzola, Maytag, and others. •Goats Milk; Chevre, Levees, plenty of variety and lots of local styles. •Ewes milk; Feta, Kasseri, usually in brine. •Strong smelling; Limburger, Liederkranz, washed rind. •Spiced/flavoured/smoked; Petite Boursin lots of commercial types, smoked cheddar. do you have a cross reference chart for which wines go best with certain cheese? There will be in the near future. I will be having regular information about all things cheese as well. CheeseGirlSara and FoodGirlShannon are beginning to work with me and we have a great deal of information to share, stay tuned and thanks for your inquiry Carla. The reference chart has been posted, I hope this is helpful. I want spent 10 days in France to learn better french cheese. what shall I do? Thank you for your kind comment, WineGuyMike makes an effort to provide solid content that adds value. With every post it is my goal to do a better job, thank you for the inspiration. Thanks for joining the WineGuyMike blog, I appreciate it. Please visit my links page as I have posted your links so my readers may visit your blog. I can see that it will keep us informed on what’s currently happening in Pendleton Oregon, thank you.